God, at that point really listened. There weren’t that many people to observe and a lot of them hadn’t developed the power of speech or complex thought yet. This proto-Freeman was in the Gifted and Talented segment of evolution. So, God paid attention and as we know from the Torah, God (at that point) was a spiteful, jealous and vengeful God. The thought that this early human would have the hubris to want more was just too much — I gave him consciousness, the ability to reason, to hunt, to use tools, to actually gather hard woods to make his broiled wallaby taste better and he complains about the wind on his ears? That day a curse was set down upon my line. Each generation hence would notice in their 20s a few odd hairs now and again surfacing from their ear canal. They would be wiry and black and show up unexpectedly as if they had grown overnight. They would multiply with ferocity each year until death. They would not protect the ears from cold. They would not stop the winds from touching the ear drum. They would simply look as if a dark stand of papyrus was growing from one’s skull. I have battled this curse for years. Plucking, tweezing, chopping and once gratefully allowing a Turkish barber to burn these wiry demons from my person. All for naught. They keep coming. In New York, the progeny of the cursed line seemed legion. On the subway, I saw my brothers every day: Neat men, well-groomed gents, Black, White, Indian, Latin, Arab with the tell-tale signs of a lost battle with the nefarious tentacles. Then there were those that made me feel as if I should count myself lucky. Men, who through lack of grooming or lack of vanity had virtual bushes, sprouts of broccoli coming from their ears…and sometimes worse. There were those men who clung tight to the original blood-line whose hair not only creeped from depths of the ear canal, but enveloped the delicate skin of the outer protuberance with a dark, unmanageable tangle. I pitied them, my brothers whose curse manifested in so shameful a way. 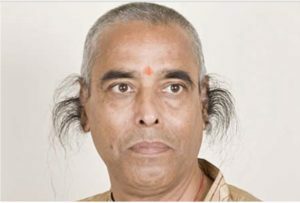 Apparently, the curse of ear hair has not reached the men of Tokyo. I have been caught staring at the rows of pink, unblemished, seashell-like ears that shine from the heads of Japanese salary men as they ride the subway home. Not a hair. Not a whisker. Not a wiry barb protrude from these ears. It isn’t that Japanese men aren’t hirsute — I have seen hairy-legged teenagers and sumo with back and shoulder hair that would make any classic New York Pizza Man proud. But ear hair? Here I am alone, adrift in a land whose progenitors never had the hubris to want just a little more than a safe place to eat some grilled meat.